I’ve spent the past few weeks living the life of a humble American amidst the cherished Italian way of life here in the valley of the Alps in Northern Italy. 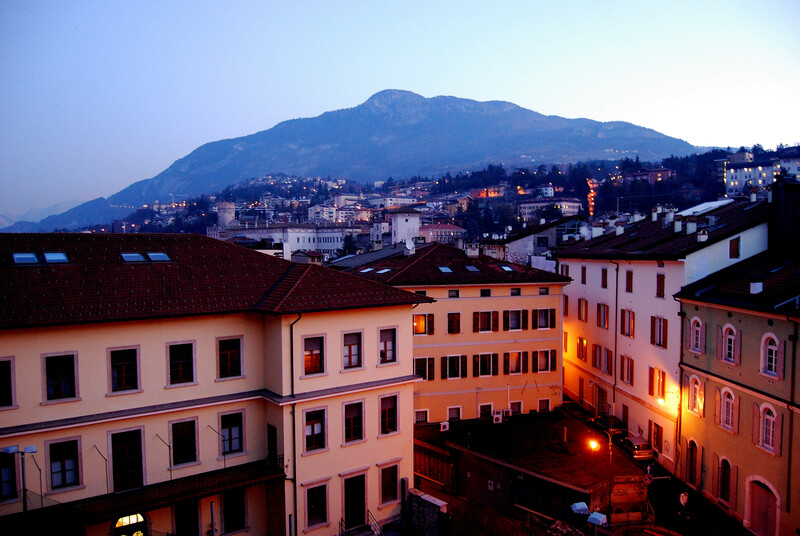 Having concluded two weeks of my three-week stay, I am sitting here on a Saturday evening in my one bedroom apartment located in the shell of the ancient walls of the city of Trento. I have easily assimilated to some of the key traditions to the Italian way of life. Presently, I am sipping a glass of mind-boggling delicious, yet inexpensive, Prosecco which was harvested from the local vineyards here in the hills of Trento. On the stove is slowly simmering Bolognese sauce I’ve created from my weekly trip to the food market here in town. Fresh local ingredients combining into a small tribute to the Italian way of life. Down on the corner from my window is a lone accordion player sending his somber notes soaring gently upon the mild winter breezes which also carry with it the many aromas of local food into the open window of my apartment. The bell chimes the announcement of six o’clock from its ancient tower a short distance away. Currently, the movie musical ‘Nine’ has reached its peak in popularity around the world and there is one such song which continually plays on a local commercial promotion tied to an Italian car company. The song’s refrain is “Be Italian…” which is full of primal passion. As an American living amidst these rich and unapologetic traditions, I’ve been reflecting upon this question of what it means to “be Italian”. Based upon my observations, to be Italian means to slow life down and reach deep into the passion of human existence. To speak passionately… to eat passionately… to love passionately… to live passionately. Time is one institution that Italians refuse to take for granted. Driven more by the rhythm of life and less by the shackles of opportunistic indulgence, Italians seize the gift of time and exercise a humanistic dominance over each day. People set the pace rather than the insatiable expectations and demands all too familiar to Americans. At this point in my life, I feel I was purposefully ushered here to witness this snapshot of human existence. Workdays begin at 9:00 and shortly upon arrival, the grand social tradition of taking coffee, or as known to Americans as espresso, begins. To invite another to take in a coffee is translated as an invitation to connect socially for conversation and to deepen relationships. Lunch is a sacred institution often consisting of a prima piatto, a first course which typically consists of a pasta dish, and a secondo piatto, a second course which is typical some type of meat. Regardless or working rank, lunch is a time to draw people together once again to share not only in food but also in conversation. A touch of vino or a small birra is not uncommon. To work through lunch, which is so common to Americans, is nothing short of blasphemy. In terms of promptness, being late is the forgivable norm… almost a subconscious statement that time will not rule the day. Speaking of lunch, shops in town often close down during lunch and re-open around 3:00 PM. Overall, food is a ritualistic tradition which is both a way to express passion and galvanizing force that brings people together. Whether it be lunch or dinner, there is often one seating with meals lasting for hours with no pressure by restaurant owners to leave. A portion of which of this time is to eat, but more so a time to enjoy a coffee and continue the conversation. As for the Italian people, there is no other way to put it than to say they are loud. But you should not misunderstand nor should you stand in judgment, as the volume is an expression of nothing more than passion. An American can only stand in appreciation of a society which lives so directly and openly. Ah, to be Italian… and whether or not you are Italian, I implore you to take great notes from these intimate lessons of life.